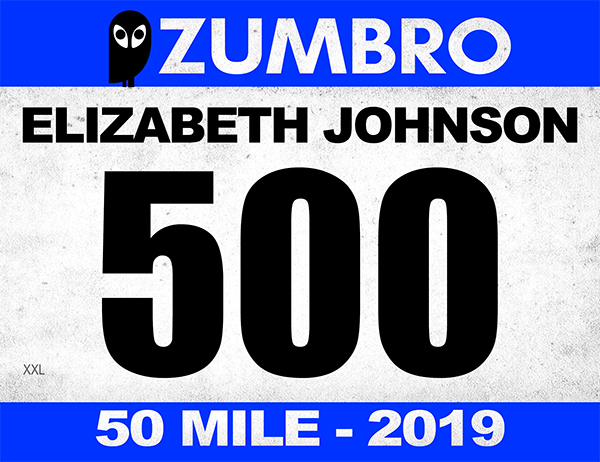 The Zumbro Endurance Run hosts three races simultaneously, the Zumbro 100 Mile Endurance Run (starts at 8:00 AM Friday) and the Zumbro Midnight 50 (starts at 12:01 AM Saturday) and the Zumbro 17 Mile Trail Race (starts at 9:00 AM on Saturday). Each distance will have its own unique race number (unique color and number series) so runners can be easily identified by race officials, volunteers, spectators and other runners. Additionally, 100 mile runners will be given a piece of pink ribbon to tie to the back of their running vest, belt, hat, shorts etc. so they can be easily identified from behind (and given the right of way) by other runners. 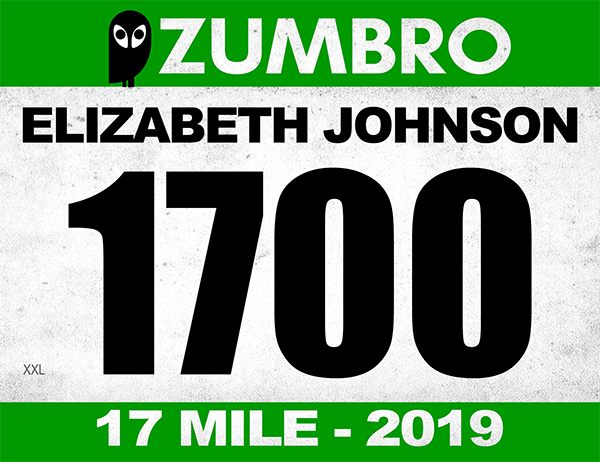 Runners who register by the deadline will have their name custom printed on their race numbers. We ask that all competitors wear their number on the front of their body on their outer-most layer at all times. Runners will be tracked coming into and out of each aid station. If we cannot see your number, we cannot track you or take your finishing time and if we cannot do that, you will be disqualified and will not earn an official finish. 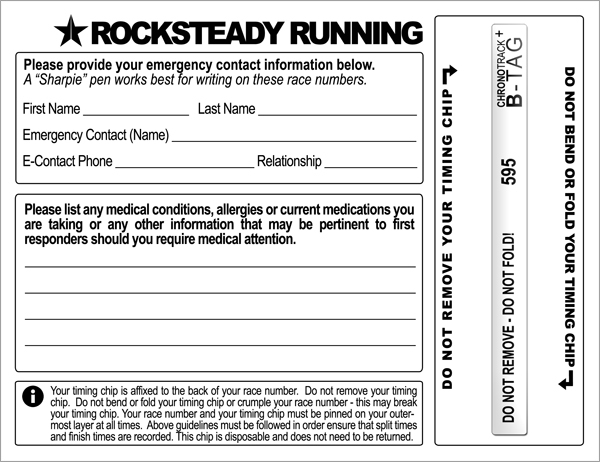 * NEW since 2017 (Zumbro and all RSR events): We will no longer be printing your emergency contact info on the front of your bib (the only info in addition to your name will be your shirt size) – we encourage you to write-in your your emergency contact information on the back of your bib (scroll to the end of the page for the bib-back example), We will have Sharpie markers at check-in so you can do this. 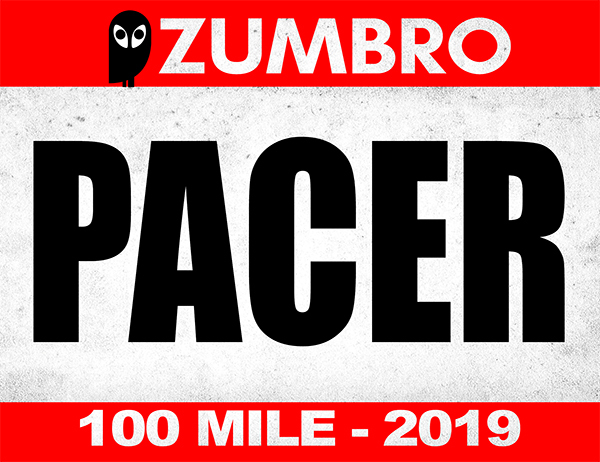 * NEW since 2018: We are requiring pacer bibs for 100 mile runner’s pacer(s), you can pick up pacer bibs (as many as you need) at packet pickup or on race morning to give to your pacer(s) or they can come see us anytime for one. The Zumbro Endurance Run will be chip timed. Your timing chip will be affixed to the back of your race number. Do not remove your timing chip. Do not bend or fold your timing chip or crumple your race number – this may break your timing chip. Your race number and your timing chip must be pinned on your outer-most layer at all times. Above guidelines must be followed in order ensure that split times and finish times are recorded. This chip is disposable and does not need to be returned. The course consists of a mix of rugged single and double track trail with rubble, loose rock and sand along with minimum maintenance gravel roads. The race is primarily concentrated in two large valleys within an expansive hardwood forest. There are four significant, short, steep climbs (approx 300FT) per loop with small hills in-between along with some significant stretches of flat valley floor running. Be sure to see maps, elevation charts and stats provided on this website HERE. 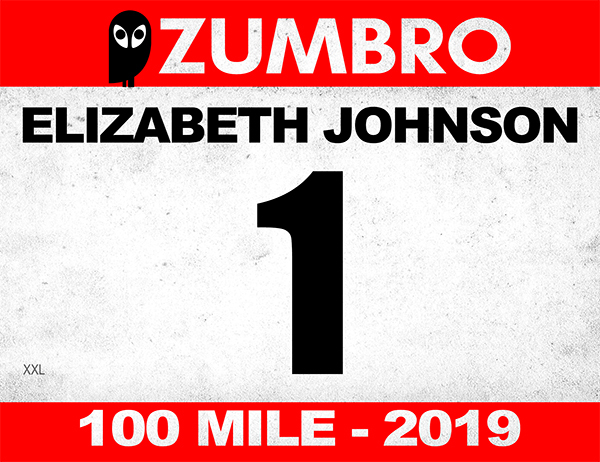 The Zumbro Endurance Run 100MI, 50MI and 17MI trail races take place within the Zumbro River Bottoms Management Unit in Southeastern Minnesota’s Bluff Country – just outside of the tiny village of Theilman, MN approximately 1:45 from Minneapolis – St.Paul, MN. The races start and finish at the West Assembly / Horse Campground Area. Generally speaking the Zumbro River Bottoms Management Unit lies within a portion of the Richard J. Dorer Memorial Hardwood Forest – an expansive 1.7 million acre tract of Minnesota hardwood forest on the Northern edge of the Driftless Region which is mainly characterized by its tall bluffs and deeply carved river valleys. This “bluff country” is rugged, hauntingly beautiful and provides the perfect venue for 100, 50 or 17 miles of trail running – while this is certainly not an “easy” trail race it can still be a great choice for your first 100, 50 or 17, that is if you are ready for a good amount of climbing / elevation gain. This is a laid back, old school, low-key trail race hosted by ultrarunners for ultrarunners.